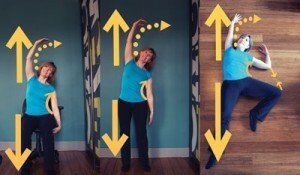 As a Certified Laban/Bartenieff Movement Analyst (CLMA) and a Registered Somatic Movement Therapist (RSMT), my training was based on the fundamental connection between body and mind. After all, humans (unlike other mammals) are not born with instincts. If they are left alone in the woods, they die because they do not know (intellectually) or know how (physically) to crawl up onto their mother for sustenance. They must be picked up and taught to suckle in order to survive. Their ability to think, reason and learn comes from their movement — passing through a series of developmental patterns during their first year and cycling through them again and again up to around 4 years of age in this massive brain development process. It’s therefore no surprise that a quick search on the Internet reveals dozens of studies correlating the connections between movement/exercise and mental health. (Here’s a great Huffington Post link: huff.to/23piqtO). After all, the brain is created through movement and is constantly influenced by it. 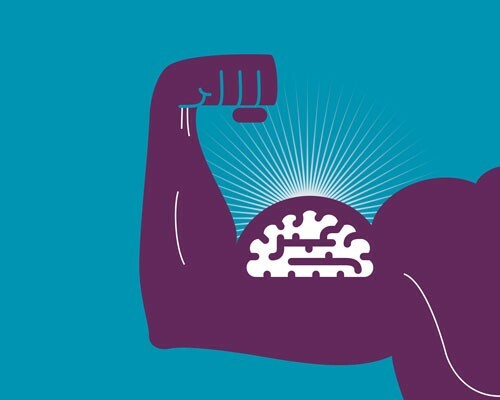 The brain/mental health benefits attributed to physical activity include improved sleep, reduction of stress and anxiety, “feeling good” from the release of endorphins (the body’s natural pain killers), increased brain plasticity (building new brain cells — there’s that developmental piece again! ), and improved creativity. It’s important to note that all kinds of movement activities are shown to decrease depression. Recent research, including studies by the World Health Organization (WHO), predicts that depression and the chemical changes it creates in the brain will soon be the number one cause of physical disease in the body. Here’s some motivation: In Miranda Esmonde-White’s book Aging Backwards, she devotes a significant amount of time defining “sedentary.” If you work out a few times a week, or even daily, you may think you are “active” and getting all those movement-related benefits in your life. Unfortunately, there’s a rub: A National Health and Nutrition Examination survey shows that most people will sit for six or more hours a day, and other studies put that number as high as 21 hours a day when you combine all sedentary activities, such as sleeping, commuting, watching television and eating. So, even if you are doing your 30-60 minutes of exercising in one fell swoop, you are still considered sedentary and subject to all the disadvantages that it brings in terms of decreased circulation, increased muscle tension and risks of chronic debilitating diseases that rival those of habitual smokers. That’s right: The new catch-phrase for this phenomenon is “sitting is the new smoking.” Sadly, just punching in and out on your exercise time-clock does not do the trick. About half of my practice is made up of a diverse group of attorneys — corporate, civil, employment, immigration, real estate, prosecutors and judges — who tend to have a couple things in common: They are high in their mental IQs (intellectual knowledge) but low in their body IQs (bodily knowledge). As a movement educator, I have my work cut out for me. Smart people, by their nature, think they can change their bodies just by thinking about it. Unfortunately, as I mentioned at the beginning of this article, the body doesn’t learn from the brain: The body teaches the brain. In 1911, Rudolph Laban (LAH-bahn) was already talking about the Industrial Revolution beginning to pull us out of our bodies. More than 100 years later, technology continues to de-humanize us. As we move away from and out of our bodies, we disconnect — literally — with our selves. It stands to reason that this separation causes — you guessed it — anxiety, stress and strain. Like all good mechanical equipment in poor repair, we begin to break down. But here’s the good news: The repair process can actually be fun. It’s Time to PLAY Again!!! As kids, most of us played hopscotch, jumped rope, rode our bikes and were in good shape! We learned balance, coordination, got our cardio in, and we never called it “work.” We moved and laughed and played, usually with friends. It was social. It was physical. Our bodies and brains were focused on FUN. When did it become a WORK-out? New rule #1: When your phone rings, stand up to answer. While talking, pace around your work area, do some squats, and keep a small, spikey rubber ball handy to roll your feet on, stimulating all the nerve endings there (which go directly to your lumbar spine) and breaking up any stiff plantar fascia. New rule #2: When you hang up the phone (see above), place your hands on either side of your rib cage with the thumbs to the back, touching the tips of your shoulder blades. Take in the biggest breath you can (over about five seconds), trying to push your hands to the sides and your thumbs to the back, and then slowly and fully exhale feeling the muscles between each of your ribs contracting and fully emptying your lungs. Do this three times before returning to your chair. THIS IS A BIG EXERCISE. Full respiration requires the participation and coordination of many muscles, especially your diaphragm and pelvic floor, stimulates your parasympathetic nervous system (which calms your body), lowers your heart rate and blood pressure, reduces anxiety, and creates dynamic support for your posture. Not bad for two minutes! New rule #3: While sitting in your chair, imagine yourself encased in two pieces of Plexiglas, one in front of you and one behind. 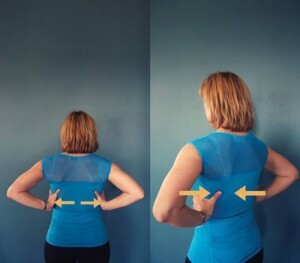 Reach one arm up in the air and feel your shoulder blade pull up and away from your hip while simultaneously pushing that same-side hip down into the chair. This will cause your opposite shoulder to slide down. Keep reaching up and down until you feel your body begin to curve to the side. If you don’t feel the curve, you have not reached up and down far enough. Once in the curve, take a huge breath into the open side of your ribs. This will feel GREAT. Return to your start position and do the same on the other side. You can do this standing, pushing the hip, leg and foot down into the floor while pulling the shoulder blade up and reaching through the hand. To feel the entirety of this movement, a Body-Half Pattern, lie on the floor and do it. The side you are not opening will naturally begin to close. I call this “Gingerbread Man” because you want to stay as flat as possible, even when the arm and leg bend. Because most of us spend our entire day in the sagittal plane (think movements going front and back only), activating the lateral muscle structures is like putting scaffolding on the sides of your body to give you extra support, in addition to stimulating your circulation. Lindsey Hanahan is a Denver-based movement therapist, Pilates instructor and owner of MOVE Studios. She can be reached at lindsey@movestudiosdenver.com or visit movestudiosdenver.com.